Are Flu Shot Symptoms Contagious? According to the Food and Drug Administration, more than 40 percent of people who receive the flu shot experience side effects such as injection site pain, a low-grade fever, a cough or a runny nose. These symptoms are almost always mild and rarely last longer than a day or two. However, they can lead to the spread of disease if good health habits are not observed. The flu shot is an inactivated virus vaccine, which means that the virus in the vaccine cannot cause the flu. However, notes the Centers for Disease Control and Prevention, it takes about two weeks for a flu shot recipient to develop immunity. People who are infected with live circulating flu viruses during that interval can still spread the flu, especially if symptoms of the flu are mistaken for symptoms of the flu shot. Other kinds of bacteria and viruses are also spread through body fluids. Coughs and sneezes caused by the flu shot propel germs through the air where they can infect other people. According to the CDC, other people need not even be present at the time--bacteria and viruses can survive on inanimate surfaces such as food utensils, door handles and even fabric. 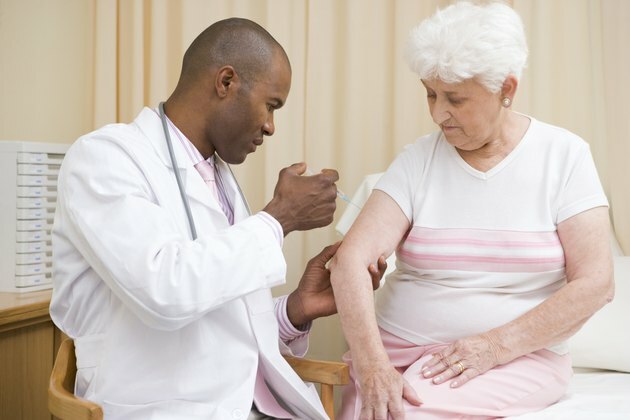 People who receive the flu shot should practice good health habits to avoid spreading disease. Good health habits recommended by the CDC include such behaviors as covering the nose and mouth with a tissue during a cough or sneeze and washing hands or using an alcohol-based hand rub before and after touching the mouth, nose or eyes. The flu shot often produces a small amount of bleeding at the injection site. For their own protection and that of others, patients should keep the injection site covered until secretions stop, then discard the bandage in the trash. CDC: How Well Does the Seasonal Flu Vaccine Work?